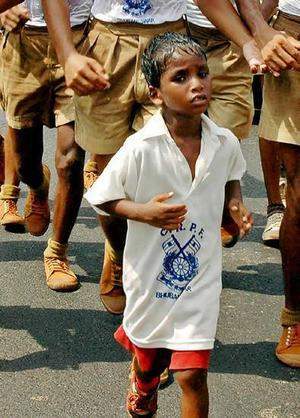 Budhia Singh (born 2002) is a five-year-old (as of 2007) Indian boy and the world's youngest marathon runner. Generally considered an athletic phenomenon, Budhia has participated in (and finished) races of up to 60 kilometers (37.3 miles) in roughly six hours and thirty minutes. He runs seven hours at a stretch, sometimes as much as 48km (30 miles). On a daily basis. When Budhia's father died some years ago, his mother, who washes dishes in Bhubaneswar, capital of the eastern Indian state of Orissa, was unable to provide for her four children. She sold Budhia to a man for 800 rupees ($20). But the young boy came to the attention of Biranchi Das, a judo coach and the secretary of the local judo association. Mr Das said he noticed Budhia's talent when scolding him for being a bully. "Once, after he had done some mischief, I asked him to keep running till I came back," Mr Das told the BBC. "I got busy in some work. When I came back after five hours, I was stunned to find him still running." Mr Das, also the president of the residents' association of the run-down area where Budhia used to live, summoned the man who had bought Budhia and paid him his 800 rupees back. Then started a strict diet and exercise regimen that saw Budhia adding a few kilometres to his daily marathon every few days. In place of a few lumps of rice that he used to get at his mother's place, he now has a diet of eggs, milk, soybean and meat. He starts running at 05.00 each day and does not stop till noon. After a few stretching exercises, he has lunch and goes for a siesta. At 16.00 it is time to run again. Budhia is enjoying his stay at the judo hostel. "I can run and eat to my heart's content here," he says. His speech is not yet easy to understand. Though he has yet to go to school, he has completed learning the alphabet of Oriya, the local language. Budhia's coach has now set his eyes on a place in the Guinness Book of World Records. That, he says, will be possible when he can run for 90km at a stretch. "I have no doubt whatsoever that he will achieve it soon", Mr Das says.